In late 2013, a significant blue-green algae bloom caused Clear Water Lagoon’s natural filtration process to fail, with the result being that the lagoon was no longer able to provide water of an appropriate quality for the Mount Isa community without subsequent filtration. The blue-green algae bloom in Clear Water Lagoon has grown to be potentially the largest ever recorded in a Queensland water supply system. Levels of blue-green algae peaked at never before seen levels of more than 6,000,000 cells per millilitre (measured 9 February 2015) — 10,000 cells per millilitre is considered normal and acceptable. While cell counts fluctuate seasonally levels have remained unaccpetably high up to the present time. As there was no likelihood that the algae bloom could be resolved within a suitable timeframe, the MIWB introduced a filtration system. The filtration system was essential and urgently sourced by the MIWB to ensure it could continue to provide Mount Isa City Council with safe water with the level of assurance required for drinking water supply. Investigations have revealed that similar wetland ecological collapse has been observed in other parts of the world. Research is inconclusive regarding the cause, however, it is apparent that the material filtered out of the water by Clear Water Lagoon during its 30 years of service remains as sediment in the lagoon. Restoration of an ecosystem cannot be achieved quickly and given we now know it can fail, it will never be able to meet the process assurance requirements of modern drinking water standards. As such, the MIWB has invested in new, permanent micro-filtration equipment to ensure on-going water quality for the Mount Isa community. The new equipment was introduced in March 2015 and fully operational September 2015. An alternative to mechanical/chemical filtration of water. Mount Isa Water Board’s Clear Water Lagoon was the only documented natural filtration facility as part of the treatment process of potable water in Australia. It provided filtered water to the Mount Isa community from 1982 until late 2013. Figure 1 – Clear Water Lagoon: The primary components of the reed bed system. The lagoon was partitioned off from Lake Moondarra in 1968, approximately 10 years after the Leichardt River was dammed downstream of Mount Isa City. It was built as a protected reservoir to overcome high turbidity inflows entering Lake Moondarra during the wet season. The physical and chemical quality of the water improved so significantly that in 1982 the decision was made to divert water through Clear Water Lagoon year round. Since water quality monitoring began and until late 2013, outflow consistently complied with Australian Drinking Water Guidelines (ADWG). 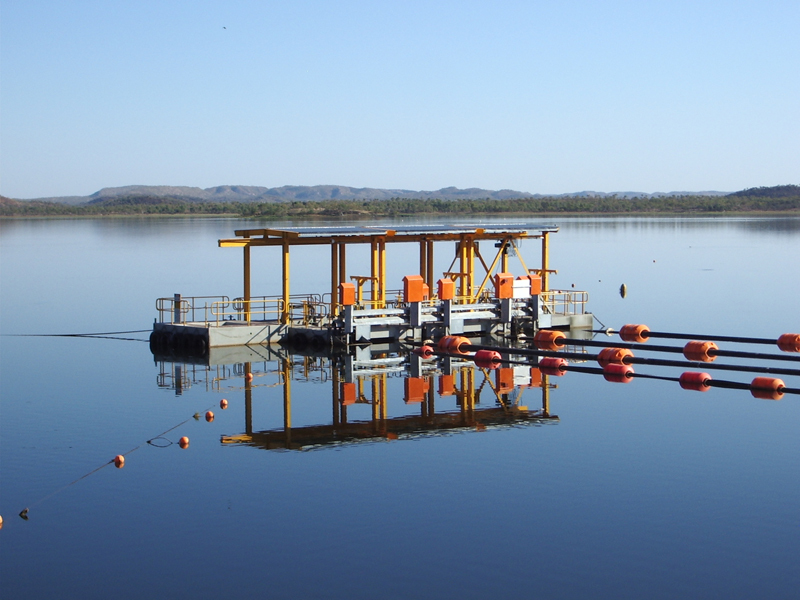 Clear Water Lagoon is still considered a valuable part of water treatment, providing pre-treatment to average 1,600 megalitres (ML) per month of water, supplying Mount Isa’s population, mining and industry. The main lagoon is on average 8 m deep, storing approximately 30 days of water. Col Popple Pump Station has the capacity to pump down to 1.8 m, which equates to five days’ supply. 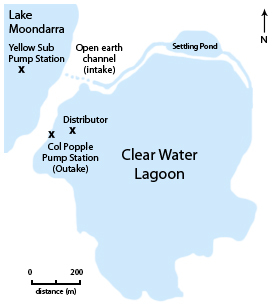 Water from Lake Moondarra is pumped into Clear Water Lagoon via an open earth channel which directs flows through a settling pond. The cascading nature of the channel allows water to be partially aerated. A second channel directs settled water into the main lagoon. Aquatic vegetation and regulated flows are utilised in a similar way to constructed wetlands. Historically, the dominant macrophytes (aquatic plantlife) in the lower flume, settling pond and main lagoon include Hydrilla vetricillata, Potamogeton tricarnatus, Typha orientalis and Vallisneria spiralis. These macrophytes were instrumental to the water clarification process because they acted to trap suspended matter, altering micro-scale flow velocity patterns around the foliage and prompting settlement on the bed of the lagoon, where they remain today. The macrophytes have more recently given way to an algal-dominated system. Restoration of Clear Water Lagoon cannot be achieved quickly and, given we now know it can fail, it will never be able to meet the process assurance requirements of modern drinking water standards. 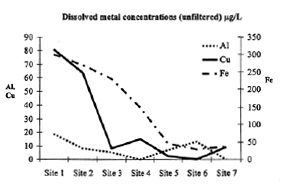 Figure 2 – Metal concentrations. Site 1 is located at the top of the inlet channel. Site 7 sampled at Col Popple Pump Station.